Aaron Charles Rodgers is an American football quarterback in the National Football League (NFL). He initially gained recognition when he received an athletic scholarship in 2003, where he started to play for the California Golden Bears football team. Aaron Rodgers’ net worth is estimated to be roughly $70 million as of 2019. He is currently playing for the Green Bay Packers. Aaron Rodgers was born in Chico, California on the 2nd of December, 1983. He grew up with his parents and two brothers in Ukiah, California. His father Edward played football for the Chico State Wildcats. Aaron’s ancestry is German, Irish and English. When he was 10 years old he was featured on the Ukiah Daily Journal. The Rodgers family relocated to Chico in 1997 and he attended Pleasant Valley High School, where he started his career as a quarterback. During Rodgers college years he led the school to a No 2 ranking and a 10-1 record. His success caught the eyes of the talents scouts, and the following season he enrolled to be the college team starter. Rodgers started his NFL career by coming to the team Green Bay, where he started as a quarterback. He endeared himself to Green Bay fans and press. Rodgers proved that he was one of the elite quarterbacks when he helped his team to win over the Packers in Super Bowl XLV. He earned MVP honors completing 24 of 39 passes for 304 yards and three touchdowns. He maintained his position among football’s top performances in their successive seasons. Rodgers missed seven games of 2013 with a fractured collarbone but he came back later on to the regular season where he leads the game against Bears to a victory. The following year he led his team to a playoff. When Rodgers did his 100th game he reached the first rank in NFL history. He is among all quarterbacks having the best touchdown passes, yards and a passing rating of all time in NFL history. In April Rodgers was announced as a limited partner in the Milwaukee Bucks, making him the first active NFL player with an ownership in an NBA franchise. What is Aaron Rodgers’ net worth? Aaron Rodgers’ net worth is $70 million, and he is now one of the best quarterbacks in NFL, alongside the likes of Tom Brady. Aaron Rodgers is one of the best quarterbacks of all time. He was selected in the first round of NFL draft by the team Packers. Rodgers has shown that no matter how great you are, you are never too good to improve and impress people. He is using his skills to help other people, his unique play skill has impressed the world, and that is one reason why he has gained an incredible net worth. Aaron Rodgers’ net worth is estimated to be $70 million dollars as of 2019. 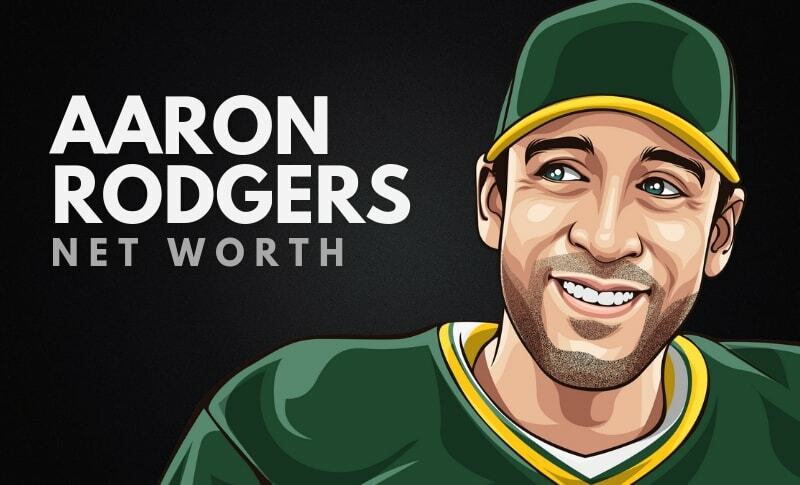 What do you think about Aaron Rodgers’ net worth? Leave a comment below. Wealthy Gorilla was founded in 2014, to serve as an inspiration to people from all ways of life. At Wealthy Gorilla, we cover articles on self-development, entrepreneurship, inspiration, quotes, and motivation. Today, we are receiving over 2 million views every single month.